Photographs by Patti Nagai“Sir Winston Churchill” is a fragrant, double blossom daffodil. 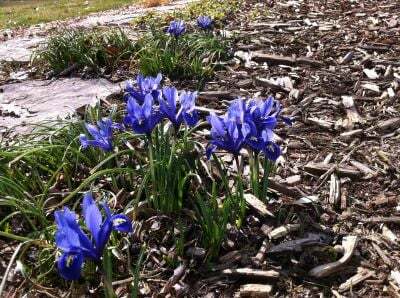 Early purple blooms of dwarf iris brighten the garden in March. Select daffodils based on size, color, fragrance and time of bloom. \'Sir Winston Churchill\' has a double bloom in May that fills the air with a sweet fragrance. Grape hyacinths bloom in May, and are some of the easiest bulbs to plant and grow. Nothing is more heartening after a gray winter than to see the colorful tops of crocus or the deep blue dwarf iris peeking up through the snow, or the sunshiny brightness of winter aconite so early in spring. Planting now could provide beautiful blossoms as early as the first week of March; imagine the bright colors after a long, cold winter. Where will beautiful spring flowers bring me the greatest joy? How big is the area I want to plant? Are there animals in the area that might dig up my bulbs or eat my flowers? Peruse the amazing bulb selections online and/or visit your local garden center for inspiration. 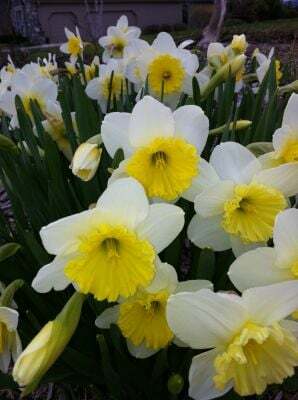 If you are challenged by deer or other flower-loving critters, consider an area of naturalized daffodils and winter aconite, or a smaller area near your home planted with dwarf iris, miniature daffodils, grape hyacinth or anemone. Smaller bulbs such as grape hyacinth, anemone, and winter aconite should be planted at a density of 14 to 24 bulbs per square foot. These types of spring-flowering bulbs tend to be less expensive per bulb, but for a good effect, plant a lot of them. Smaller bulbs are not planted as deep as daffodils or other large bulbs. So, dig a square foot area 2 to 4 inches deep, scatter 14 to 24 bulbs, cover with loose soil (and compost if you have it), then move to the next square foot. Easy! Larger bulbs are typically planted 4 to 5 per square foot, and should be planted about 4 to 6 inches deep. A bulb planter, trowel, or special bulb auger drill attachment can be used to dig holes. If a bulb is not planted deep enough, don’t worry, eventually the bulb will bury itself deeper. For a naturalized look scatter the bulbs in an area and plant where they fall. If that means planting two or three bulbs in one hole, so be it. The closer together you plant, the greater the color effect, but the higher the nutrient needs. Fertilize the bulbs when planting, and plan on fertilizing again in spring when leaves are 2 to 4 inches tall. If you forget, not a problem that first year, they will still bloom. It is the second year of blooms you are helping when you fertilize. Daffodil, crocus, dwarf iris, grape hyacinth, anemone and winter aconite tend to be very long lasting in the garden. However tulips and some of the allium may not last as long, especially if they are not fertilized. Plant bulbs until the ground freezes! But make sure you get them in the ground before winter really arrives. March will be here soon, and those first signs of spring will be your reward for planting now. Patti Nagai is the horticulture educator for Racine County UW-Extension. Contact her at 262-767-2913 or email mastergardener@goracine.org. In Kenosha County, contact Barb Larson, 262-857-1942 or email Barbara.larson@ces.uwex.edu. In Walworth County, contact Christine Wen at 262-741-4958 or email Christine.regester@ces.uwex.edu.